Jim’s Pest Control technicians across Australian are getting more and more concerned with the declining bee numbers across the word and believe that we should not be adding to these declining numbers. This is why in most states of Australia you will find professionally trained specialist franchise that will actually choose to capture bee swarms and hives, and relocate them rather than taking the easy option of killing them. These franchisees choose to work with the relevant bee societies and bees keepers in each state. At Jim’s Pest Control we have developed specialised techniques for capture and relocation of bees. The franchisees offering this service work closely with bee keepers, both professional and residential. We have a list of bee keepers that have hives awaiting for bees. Please be aware if you chose this service we may not be able to capture all of the bees and it maybe necessary to eliminate a handful of bees after the capture. 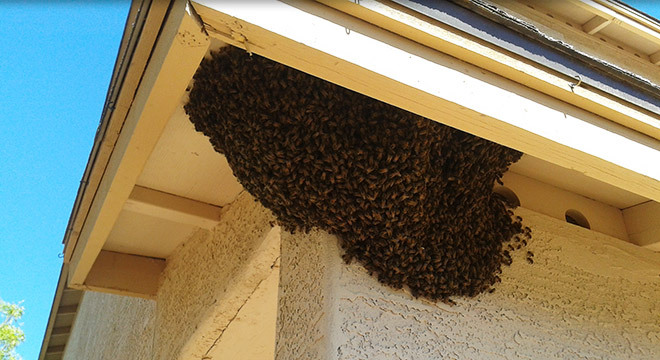 So if you have a bee swarm in your yard, rather than just call a pest control company to kill them please ring Jim’s Pest Control on 131 546 and enquire to see if there are any of our Pest Controllers in your area that can live capture the bees instead, and safely relocate them to a better place for all. The service was far and beyond my expectations. In particular, Lynton – the person who carried out the job – was very professional in the way he went about it and I found him to be exceptional in his deep knowledge relating to his work. He was also most empathetic, realising the devastating effect the infestation had on me, and immediately set about reassuring me, which he did most effectively. I cannot commend him enough. Very impressed by the efficiency & thoroughness of the pest control job. Very amicable & professional to deal with too — thank you! Paul from Jims came to see me on the day of my call. The work was started immediately as there must have been 30 pigeons nesting on and under my solar panels. Paul from Jims went above and beyond for my needs. I was contacted by Lawrence's wife within 10 minutes of contacting Jim's for flea treatment to a rental property. I was very impressed with their friendly, helpful and professional advice and service. Fantastic job done and great value for money! Had the house sprayed for spiders. Lovely husband and wife team. Very efficient and friendly . I would definitely go with Jim's again!